The cool room was about half full, the slatted cedar chaises covered over with towels and on the towels, a mixture of solid matrons and daughters swathed in their lawn shifts, heads wrapped in turbans, and brighter younger things swathed in … I took a closer look … nothing at all! Like one of the Old Masters come to life, they lounged singly, in pairs and threesomes: Susannah without the elders, the rising and the setting sun together, Venus, Minerva and Juno awaiting Paris, all set for the judging. I sank down onto the nearest couch, loosened the cord of my robe and stared steadily ahead, unsure whether I was blushing or whether the flood of heat into my head was the beginning of this ridiculous process by which I would boil myself, like a lobster, gradually, avoiding any pain. Conversations were all around me as they often seem to be when one is alone – desultory remarks batted back and forth at full volume and other, more hushed and hurried exchanges, the sort where illicit knowledge changes hands. -- many moderns writing about the era insist on having their heroines far too politically correct. The books are also hilarious – they have complex and clue-filled plots, they are real detective stories, but Dandy’s comments and relationships are very funny. McPherson specializes in strong, fascinating backgrounds: previous books in the series have been set in a circus, a department store and a girl’s school. Each time she outdoes herself: here we have a wonderful health hydro in the Scottish town of Moffat, and as ever it is conjured up to perfection, with lots of detail about the treatments on offer, the atmosphere and the buildings. The contrast of health, the 1920s equivalent of a spa, and the extremely creepy plot is superb. Links on the blog:The books have featured before here and here. In Evelyn Waugh's Helena, the Empress Fausta dies in a Turkish bath. 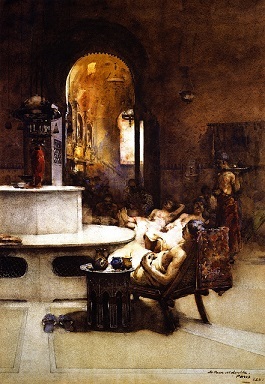 The top picture is from the Athenaeum website, by Arthur Melville of a Turkish bath in Paris, the lower one is from a previous blog entry on Dandy Gilver. Moira - Oh, thank you for this! You've reminded me that I absolutely positively must put one of these mysteries in the spotlight. I agree that McPherson should be better known that she is. I appreciate the reminder. Oh please do a spotlight of one of the books, Margot, I would love to read that.